Our opponents are trying to pull a fast one on us. They're taking Utah public money to convene a "Wild Horse Summit" in Salt Lake City next week. The gathering will attract pro-slaughter "wildlife managers" and other pro-ranching special interests to lay the roadmap to begin the killing of America's healthy wild horses. The Secretary of the Interior, Ryan Zinke, is expected to attend. We were not invited. People with actual experience implementing humane management solutions are being deliberately excluded. Peer-reviewed science documenting the success of humane fertility control as an alternative to roundup and slaughter is being censored. But we're not going to let federal officials and politicians hear only their one-sided, pro-slaughter message. Will you help us fund this billboard and other advertisements within Salt Lake City? We have just 48 hours to raise $10,000 to fund this billboard, social media ads and media campaign to fight back. Our opponents are trying to cook up every slanted argument they can: they claim the healthy horses are dying on the range and should be euthanized (not true). They claim they're overrunning our public lands (even though horses are on only 17% of BLM rangeland). And they claim killing is the only way to manage the population (despite the sound science of proven birth control methods). We need to get the facts out there. 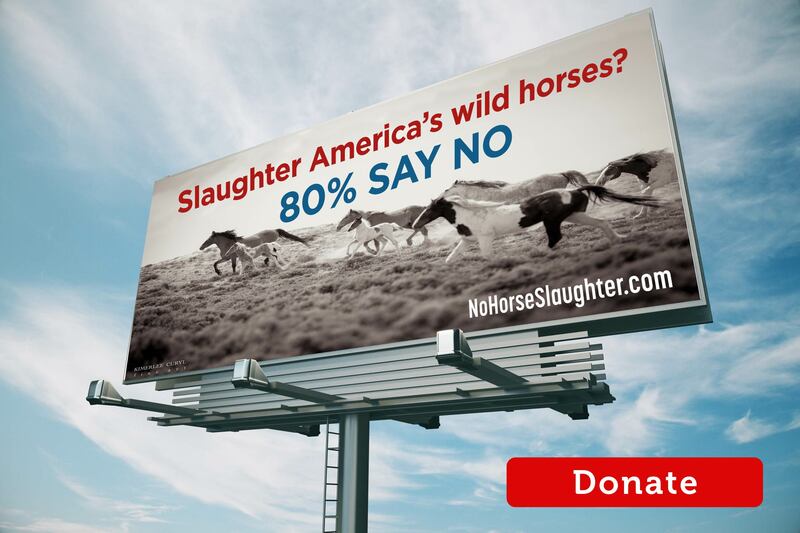 Our team will be working with the media to correct the facts, and we'll be running digital and outdoor ads in Salt Lake City to make it clear how the American public feels about slaughter. We need your help to do this. With Congress currently considering pro-slaughter legislation, we cannot let this Salt Lake City pro-slaughter dog-and-pony show take place without us fighting back. Please donate right now. We need to raise $10,000 in the next 48 hours to get this billboard up in time for the event.